When I started flight training, I did not own a headset so I had to fly "bare eared". My instructor used a set of earplugs to help protect his hearing since he flew many hours every day. The unfortunate result of that arrangement was when my instructor would talk to me while flying, he would have to shout over both the engine noise and his earplugs. Even the simplest conversation or instruction came out as yelling. After about six weeks of that in the cockpit, Susie and I had chance to fly with the owner of our flight school in his Cessna 182. It was a "Class Trip" after finishing ground school and passing our written. The 182 had a headset for each of us to wear and I truly appreciated how "civilized" that made the whole flying process. Within a week, I purchased my own set of headphones, a "push to talk" switch and a simple four-place intercom. No more yelling from my instructor (unless I deserved it). No more reaching down for the mike, trying to hook it back on its clip or chasing it around the floor while trying to call out and turn final. A few years later, the Active Noise Reduction (ANR) headsets made a splash and I converted my existing headphones by using Headset, Inc.'s retrofit. The impact was dramatic, especially in understanding ATC or other pilots. This new feature required batteries to drive the sophisticated circuitry inside each ear cup, but it was a minor price to pay considering the clarity it provided. Since I am 6' 2", the reality sank in a few years ago that I was going to have headroom problems when flying my Q. The seat cushions in my Tri-Q2 would push me up in the seat, contributing to the situation. The hardware on the top of my head holding the headset ear cups in place would not only scratch the inside of the canopy but would also restrict my ability to see over the nose during the critical landing phase. I also had visions of flying my Tri-Q2 like I used to drive my old 1977 Honda Civic. Eveiy time I hit a bump, I would tilt my head toward my right shoulder. At least in the Civic, I had some warning when a bump might happen by seeing a chuckhole in the road. Bumpy air would not be as easy to predict or anticipate. Two years ago, I noticed an advertisement for an unconventional headset called CATS, Cranial Audio Transmission System, from Panther Electronics. It was based on cell phone earpiece technology. Molds would be made of both your ear canals, the hollow of your outer ears and then sent to the company. 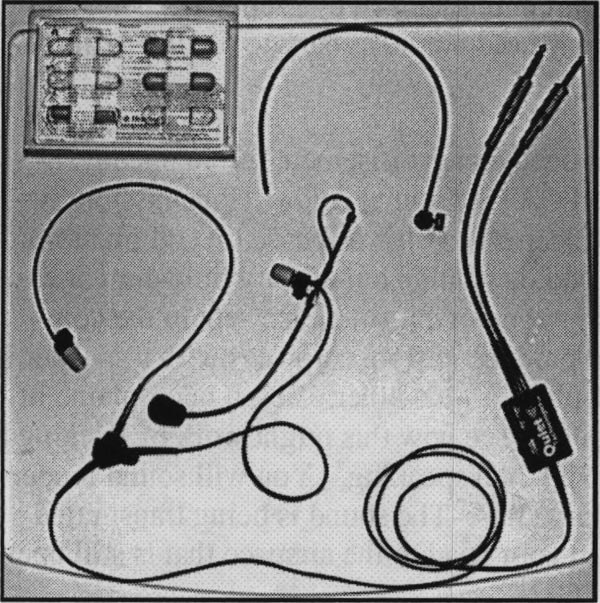 They would produce custom earpieces with a speaker in one ear and a microphone in the other. Yes, a microphone in your ear canal. You can see how this might work by sticking a finger in both ears and then speaking. You will sound louder to yourself while doing this. The sound is being transmitted through the bones in your head to the airspace that is still open in your ear canal. At close to $500 a set, I felt this was a pricy solution and hearing out of only one ear would be annoying. The literature and testimony also described a significant break-in period for you to feel comfortable with the earpieces. That concerned me. As an update, I understand that Panther has recently announced a boom mike and dual ear speakers for their second-generation CATS headset at a cost of close to $700 dollars. During the 2003 Oshkosh, I stopped by the Quiet Technologies' booth and got a demonstration of their headphone system called AuriComm. Like the Panther model, the Auri-Comm uses inserts in your ears but each ear has its own speaker. A boom mike is mounted on the right earpiece or by an optional plastic wrap-around headband. While you can have ear molds made for AuriComm, the preferred installation uses replaceable foam tips. The manufacture claims they can actually get better noise reduction using the foam tips over the solid inserts. A significant side benefit of the foam tips is air can easily pass through the foam so you can clear the pressure in your ears as you climb and descend in a more natural way. Solid inserts make it harder for the air pressure to equalize on the outside surface of your eardrum. The manufacturer goes on to claim that the noise reduction with the foam tips can provide similar or even better results when compared to an ANR headset. Many of today's ANR headsets focus on canceling the low frequencies. The foam tip acts as a general earplug, reducing noise across a broader spectrum of sound when compared to the ANR technology. At $325 a set, they are still less than many of the ANR headsets out there. While AuriComm does not require any batteries, you will have to replace the foam tips periodically as they can become dirty. I recently had an opportunity to use an AuriComm headset for 6 hours while flying in a Tri-Q2. By comparison, I also flew a similar amount of time in the same plane with the Headset, Inc. retrofit ANR headset a few months earlier. My experience revealed the following results. Physical Characteristics: The AuriComm is VERY light. They claim the part that is worn on your head is a mere .38 ounces or 11 grains. Very thin wires are used to drive the AuriComm and a clip is provided to secure the wires to your seatbelt or shirt. This clip can prevent an earpiece from being dislodged from your canal as you move your head. The wires then connect into a control box by veiy sturdy metal plugs. The box has a small mono/stereo switch and a volume control to your radio jacks. I found the volume control to be very effective. I noticed this when I accidentally turned it down in-between flights. After some investigation as to why everything sounded so far away, I realized that I only needed to adjust it. I found I could even increase the volume more, if necessary, for louder cockpits. In my opinion, my ANR headset, as well as most "cup over the ear" designs, has a flaw when wearing them with glasses. The earpiece of the frame does not let the traditional headphone seal to fully conform to the side of your head. This provides an opportunity for sound to penetrate. The AuriComm does not interfere with your glasses in any way. The foam ear tips hold the headset in place. You do feel a slight pressure from the foam tips inside your ear canal, but that did not bother me. There is no "Head in a Vice" feeling that you can experience from the standard headset arrangement. Did you know that the ear canals do not have sweat glands? That means you feel far more comfortable with the AuriComm foam tips than the hot, standard headsets. As a bonus, the AuriComm design does not give you "Headset Hair". Sound Quality: I was extremely pleased with the speech clarity from ATC and the other pilots, especially when compared to the ANR headset I used previously in that same plane. While using my ANR headset, I recall asking, "What did they say?" several times but never with the AuriComm. To review the product, I also spent some time just listening to what I could hear beyond the clear voices on the radio and intercom. I was able to identify two kinds of noises. One was the very low frequency of the engine. I did not find that range annoying in any way. I guess it was even possible that some of that low noise was actually being transferred from the plane through my bones to my ears. Either way, it was not a problem. In some ways it was reassuring to hear the engine RPM's. The other noise I could hear was a faint, high-pitched "whispering wind" that sounded like rushing air. Like the lower noise, this was not annoying and did not interfere with my ability to understand speech. The voices were much louder and clearer than the two noises I detected. At one point in flight, I had an opportunity to remove one of the speakers from my ear to reposition the microphone boom. It was very obvious how much "work" the AuriComm design was doing to reduce excess noise when my ear was then exposed to the "Full Monte" of sound in the cockpit. I would rate the sound quality and noise reduction very high. Microphone: The boom microphone attached to the right earpiece did an excellent job of reproducing my voice. In fact, I gave into the temptation to use a highly modulated, 747-captain's voice to welcome the passengers to 30,000 feet. All kidding aside, the microphone performed better than any other headset microphone I have ever used. I found the best results occurred when I positioned the foam surrounding the micro-phone so it just touched my lips. At one point, the boom microphone was resting on my chin instead and had to be adjusted. I believe, through practice, I can make sure that I insert the right earpiece in such a way so that does not happen again. If it were to become a problem, I could always use the supplied 1/8" tubular plastic headband that goes from ear to ear, behind your head, to hold the boom. Time will tell the better approach. It is nice to have options, though. Freedom of Movement: For me, freedom of movement was the "icing on the cake" benefit of the AuriComm design. My ANR headset clunked into the canopy when I would raise my head. The AuriComm did not interfere with the canopy in any way. In fact, I found I could place the top of my head against the inside of the canopy and gain at least a half-inch view over the nose. If I pointed my chin forward and touched my forehead to the canopy, I had even more visibility over the nose. Talk about being in Hog Heaven. Not only did I have more visibility, I did not have to wony about scratching inside of the canopy. There is one warning, however, for the "touch the forehead to the top of the canopy" position for my fellow bifocal wearers. Tilings will look bigger to you in this position and that can interfere with your perceptions. Ongoing Expenses: While you do not have to worry about batteries with the AuriComm, the foam tips will get soiled and need replacement from time to time. At this point, I cannot say how often. The headset comes with a starter set of 3 pair of standard and 3 pair of small foam tips. I found I used the larger size. Replacement tips cost $20 a pack and you can order only your size, if you would like. Price: The base price of the AuriComm is $325.00. The optional CD quality response feature is an additional $39.00. The company has specials sometimes where you can get this option at no extra charge. The shipping charge is $6.95 for up to four headsets. Check with them for the price of ear molds instead of foam tips, if you elect to go in that direction. Quiet Technologies, Inc. 122 Timbercrest Drive Ridgeland, MS 39157 (866) 784-3883 toll free in the U.S.A.
Is AuriComm for Everyone? The company claims that while most people will be able to use an AuriComm headset, a faction of the population will have a problem due to the shape of the ear canal and external ear. The ear molds may help, if the foam tips will not work, but the noise reduction may not be as good as you could get with the foam. The best thing to do is order a set about a week before you know you will be flying and give them a try. Send them back in the 30 days if not satisfied. Visiting the Quiet Technologies booth at Oshkosh and getting a demonstration before you buy might be another good approach. I'm keeping mine. Bruce and Joanne Crain's beautiful Tri-Q200. Bruce added the Tri-Q conversion with the new larger nose gear, an extended Waddelow canard, modified incidence on the wing and canard, a new MT constant speed propeller, RV-type pressure recovery wheel pants and custom removable wing and canard tips. Fantastic work, Bruce! You can order a printed copy of Q-talk #105 by using the Q-talk Back Issue Order Page.